Jake Epping is a thirty-five-year-old high school English teacher in Lisbon Falls, Maine, who makes extra money teaching adults in the GED program. He receives an essay from one of the students?a gruesome, harrowing first person story about the night 50 years ago when Harry Dunning?s father came home and killed his mother, his sister, and his brother with a hammer. Harry escaped with a smashed leg, as evidenced by his crooked walk. Not much later, Jake?s friend Al, who runs the local diner, divulges a secret: his storeroom is a portal to 1958. 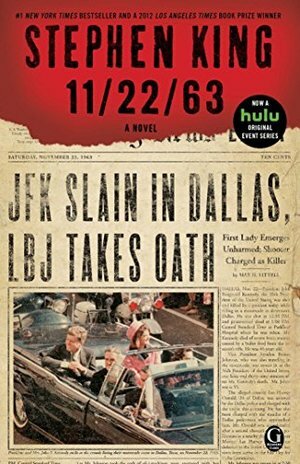 He enlists Jake on an insane?and insanely possible?mission to try to prevent the Kennedy assassination. So begins Jake?s new life as George Amberson and his new world of Elvis and JFK, of big American cars and sock hops, of a troubled loner named Lee Harvey Oswald and a beautiful high school librarian named Sadie Dunhill, who becomes the love of Jake?s life ? a life that transgresses all the normal rules of time. Well-researched, but long, dry, and no climax to the build-up. Not a big enough climax anyway. Interesting read, but was bored by page 100 or so.